﻿33m Charter Gulet Berrak Su. Modified New Look in 2014. Berrak Su gulet is an amazing luxury gulet. It has 6 ensuite cabins with aircon and can host up to max 12 pax. This breathtaking gulet has a length of 33 meters and there is enough private space for everybody. The boat has 2 levels and especially the second level is suitable for taking some fresh air and soak up the stunning surroundings. Each year various charter gulets go through different standards of refits for better maintenance, additions, modifications or other reasons. 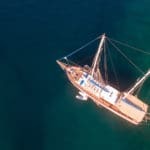 This past winter, one particular gulet underwent a superb modification where now she offers the capacity to cater to 12 guests, rather than 10 in the previous year. Not only was this a wonderful change in accommodation, but she also modified the deck space usage on board. 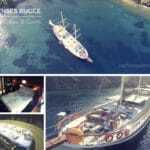 Check out the new look of the charming 33 meter gulet charter Berrak Su. She was beautiful to begin with, but now more guests can enjoy her superb services by a well trained and experienced crew of 5 (inclusive of captain, 2 hostesses, 2 sailors and of course the chef). There are 2 spacious master cabins (1 with jacuzzi), and 4 double cabins to choose from. Each are fully equipped with air conditioning and private bathrooms – which have also undergone a refit. The 2010 build gulet Berrak Su benefits from a more social setting in the aft deck with large cushions and newly constructed alfresco dining area. In addition there is more sunning space above the cabin house – where the views can be thoroughly enjoyed from a higher perspective! This fine vessel is no short of water toys – which include water skis, wakeboard, ringo, 2 kayaks and tender with 60hp outboard engine. With two 440hp diesel engines, guests can take pleasure in a luxurious cruising experience. So if you have your heart set on a magnificent Mediterranean style luxury gulet sailing holiday, this charter is sure to please, pamper and provide all the blue cruise joys of being along the turquoise coast of Turkey and nearby Dodecanese islands of ancient Greece! 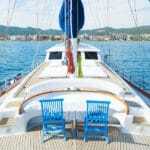 Very ideal for couples only; single, multi or 3-family group sailing holidays. Go ahead, spoil yourselves! 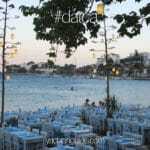 View more photos and details here on gulet Berrak Su.